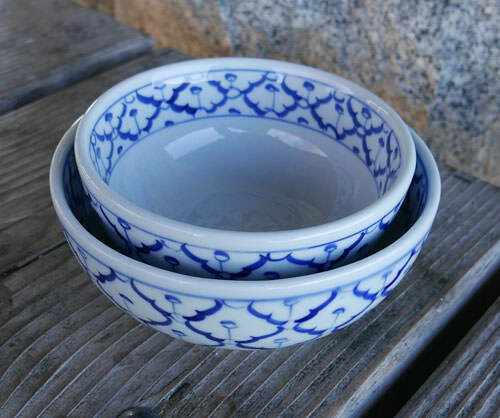 Handpainted ceramic soup bowls imported from Thailand. Vivid blue color and clean white, high quality heavy ceramic. Each piece is painted by hand using a traditional design unique to Thai artisans. You will appreciate the weight of this thick, ultra-high quality bowl. Certified for use in microwave or conventional oven, as well as dishwasher-safe. 6" (2.5 cup, 20 oz capacity) and 5" (1.5 cup, 12 oz capcity). The 6" is just the right size as a cereal bowl, or a generous serving of soup. 5" is just right to serve jasmine rice. Khao Mun is a more "high end" street vendor dish because it's more complicated to make, and requires a fairly sophisticated cart and tools. Khao = rice, Mun = fat. So this is "Fat Rice" or, in other words, rice cooked in chicken fat. We fondly recall the Khao Man vendor at Sukhumvit Road 38, who drove a pickup truck every night to the street corner and spent a half-hour setting up his tables and pots. Always served with a bowl of chicken soup, fresh cucumbers and a side dish of a unique sauce as we prepare in this recipe. Be sure to use yellow bean sauce (do not substitute) as well as cucumber. The simple marinade and cooking method here creats chicken that's slightly dry on the outside, perfectly cooked on the inside & ready for the dipping sauce. We used a charcoal barbecue with a vented lid (made by PK Grill in Arkansas), which allows us to adjust the temperature. We barbecued with lid closed at a medium/low temperature for about 30 minutes, before transferring to the oven. Our method is slightly different than what is suggested in Food & Wine Magazine, where this appeared. They recommend barbecuing the chicken at high heat for 12 minutes only, before transferring to an oven.